I'm rather sleepy today (up a bit too late with our guests last night! 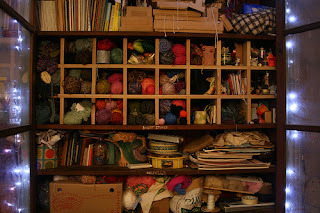 ), which gives me an excellent excuse to curl up with my sewing instead of doing any actual work. I've been cutting out lots of felt these past few days in preparation for sewing lots of batches - just the sort of simple repetetive sewing I want to do this evening, hurrah! 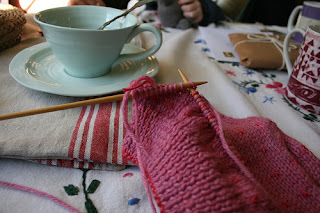 As you may notice from that picture, I've made a red version of my spotty teacup. I planned originally to also change the background colour, but decided against it. I think they look so fresh and cheerful against the yellow, they make me think of breakfast in a country kitchen on a sunny day. I also (really tragically) love how my sewing co-ordinates with my pin box in that photo! - what a great box! 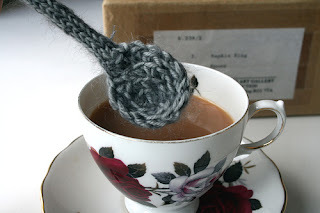 Knit aka alabamawhirly knows that I like a nice cup of tea, even adding one to my custom-ordered gloves, and today when I came to look through her Crafting 365 photos to write this little feature it was (rather predictably) the tea-themed ones which caught my eye. She says "I have loved being part of crafting 365, seeing the way that my fellow crafters work, marking the high points and the lack of inspiration moments. I am amazed at how my own work maps out, I know I make something everyday but it has been fantastic seeing it alongside other people and the support and comments from other crafters. It has been and is an inspirational project to be part of" ... and she was sweet enough to blog about my recent article here. May I ask where you get that beautiful felt? I hunting all over for a good source that has many colors. tee hee or should I say tea hee?